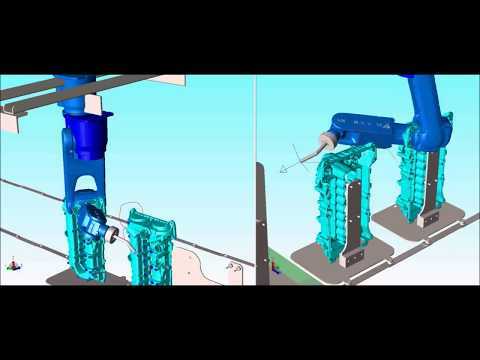 The washing system with robot, allows a treatment of industrial washing with a high degree of accuracy. Generally are the companies in the automotive and aerospace sectors that use this type of treatment because they are required high standards of cleanliness subject to strict specifications. The washing system allows to treat workpieces with particularly complex forms where it is required a high degree of cleaning in points hard to reach. The system is composed of an anthropomorphic robot with one or more spray nozzles fixed to the wrist. The programming of the movements allows then to set the sequence of treatment. 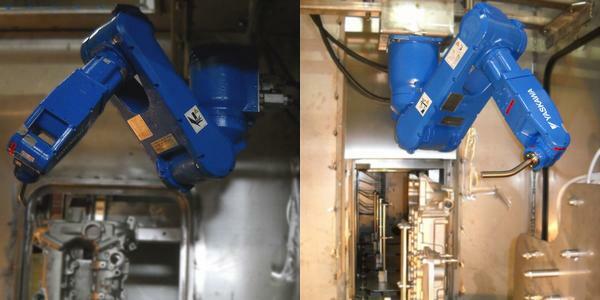 Ceever inserts the robotic system generally in its treatment chambers; Tunnel Series (Linear, Circon, Air Line and CloseDR) and Series Spraymaster (CIL and TR). The system works in a high pressure circuit (300 to 800 bar) and is particularly interesting for deburring processes for the removal of precarious burrs generated by mechanical processing. The high pressure robotic systems for washing and deburring are particularly versatile because they allow to treat parts with different shapes by means of changes to the management software of the robot.